Meditating for 26 minutes, guided by my good friend Mr. Sam Harris. Working on writing for the morning. Usually, I start the day with writing for my current book. Taking lunch, tempe sayur with three eggs, and 600ml of water. 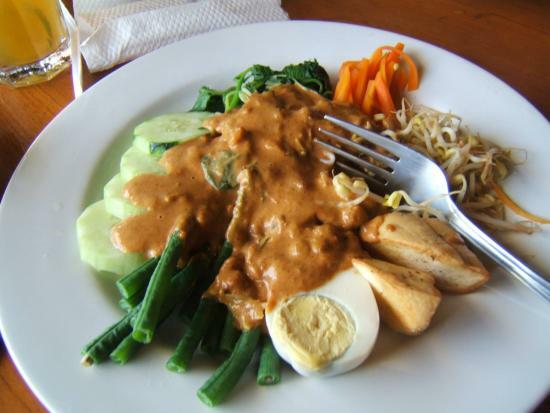 Sometimes I'll have gado-gado too. Then I come back to my bed, lie down for an hour or so, digesting, watching videos on YouTube that are inspiring to me. More writing until sundown. Usually on the blog post I'm working on, and planning for tomorrow's book section. Workout. Pullups on a tree branch. Pistol squats. Push-ups. Squats. Etc. Shower. Dinner: gado-gado, and 30 sticks of sate ayam. Talks with the kind man who cooks sate for me. Then a short documentary, or some other long-form video. And bedtime. Sometimes, I'll call with a friend or two in the morning.